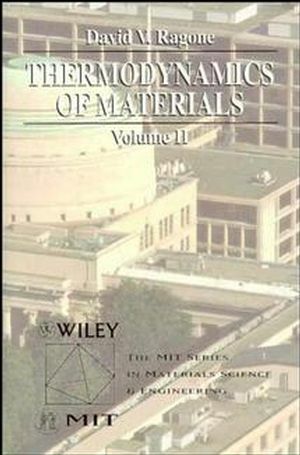 Thermodynamics of Materials provides a comprehensive reference for chemical engineers and others whose work involves materials science. Volume 2 reviews macroscopic thermodynamics before moving on to the more complex behavior of defects and interfaces. The kinetics of liquids and gases are explored through discussion of evaporation, diffusion, and molecular movement, while solids are explored through in-depth explanations of nucleation, spinodal decomposition, and reaction kinetics. Concise, with clearly-defined equations and constants, this guide is an invaluable reference for both theoretical and practical applications. David V. Ragone received his S. B., S. M., and Sc.D. degrees in metallurgical engineering from MIT. He taught undergraduate and graduate courses in thermodynamics at the University of Michigan in Ann Arbor from 1953 to 1962. From 1962 to 1967, as chairman of the materials department and assistant director of the Hopkins laboratory at the General Atomic Division of General Dynamics, he directed research on materials for advanced, high-temperature, gas-cooled nuclear reactors. He then served as Alcoa Professor of Metallurgy at the Carnegie- Mellon University, where he was also Associate Dean of Urban and Public Affairs. In 1970, he was named dean of the Thayer School at Dartmouth, and returned to the University of Michigan as Dean of Engineering in 1972. In 1980, he was named President of the Case Western University, where he served until 1987. He returned to teaching undergraduate courses in thermodynamics and the physical chemistry of materials at MIT in 1988, and began writing texts shortly thereafter. In addition to his appointment at MIT, David Ragone is a partner in Ampersand Ventures, a firm whose focus is on ventures in specialty materials and chemicals. He has also served as a member of the National Science Board and as a director of more than a dozen public and private companies. His professional society memberships include ASM, AIME, and ACS.